It is reported in the local daily that John Ruttan will be seeking a second term as Mayor of the city of Nanaimo. He is quoted as saying he aims to see a convention centre hotel built and also a foot passenger ferry between Nanaimo and downtown Vancouver during his second term. So, Is This A Clever Way To Mark A Pothole? The Results From Hitting It Too Hard? 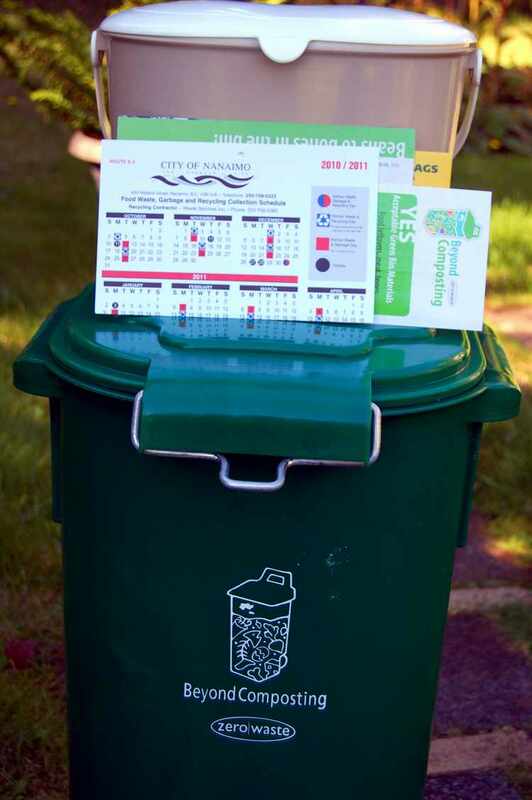 If you are one of the 17.500 Nanaimo residents who did not go on the Green Bin recycling program last fall you can expect your Green Bin and start up kits to arrive sometime in September. We were on one of the routes that went on the program last year, and I must say I had my reservations about what I thought of the idea, but after nearly a year I think it is a good program. It does take some getting used to when it comes to understanding the collection system. Every week you put out your Green Bin which contains all food waste as well as soiled paper waste which does not go with the regular recycling paper. For example used paper towels, waxed cardboard and pizza boxes could not go in the regular paper recycle bag, but can go in the Green Bin. Be sure to get familiar with what goes in the green bin and you will likely find your regular garbage bag is hardly full every two weeks. So, each week you put out the Green Bin and either your regular recycling bag (the yellow and blue ones) or your regular garbage bag. 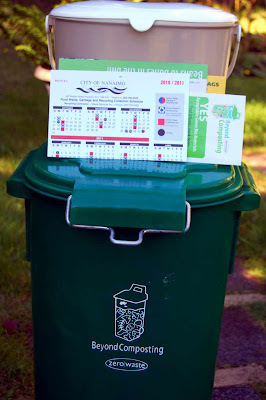 You will have to check the new garbage add a week calendar which will come with your start-up kit. Granted, it is a bit confusing for the first few weeks but soon you will not find it difficult at all, and most of all you will find your regular garbage bag is a whole lot lighter than it used to be. For more information about the Green Bin Program see the Waste Line by clicking HERE. The repairs to the damaged trestle have been completed and the Nanaimo harbour terminal for the Nanaimo to Gabriola ferry will be open again on Thursday Sept. 1. Ferry passengers will also now be able to use the new waiting room and washroom building which is designed for added comfort and accessibility. Do you remember being told how good the HST was going to be for everyone in the province? How all those savings that businesses would see would result in jobs, jobs, jobs and how all the savings would be passed down to the consumer? Remember how Premier Campbell assured British Columbians that the tax would be revenue neutral? If that statement was made in good faith from the advise of government civil servants, then you can only conclude they really don't know what in blazes they are doing. Of course on the other hand, a suspicious mind might think it was just another clever story and bit of smoke and mirrors to distract, while once again government slipped their hand ever deeper into YOUR pocket. If The HST Is Neutral, Why All The Concern? The Liberal government, under the new Premier did everything they could to convince BC taxpayers that the HST was a good tax and would be good for us. They did everything they could do to sway the vote in favour of retaining the HST. Could the answer lie in the fact, we are now being told that returning to the PST and GST is going to cost the government money? How does a revenue neutral tax end up costing the government money? Just another reason I don't trust anything that the elected and non-elected officials keep telling us. School starts in School District 68 for Grades 1 - 12 on Tuesday, September 6 at 11:00 am and will dismiss at 12 noon. There are some exceptions and for complete opening day information visit the District website HERE or click on the image above for complete information. You can also visit School District 68 website HERE. A recent survey conducted by CIBC showed that most people tend to predict they will be free of debt within 10 - 15 years, regardless of what age group they occupy. For example people in the 18 - 24 range felt they would be debt free by 32, and the 35 - 44 group chose 54. Only 35% of the people surveyed between 55 and 64 were actually debt free. I have noticed an ad on the telly for a life insurance company which is actually presenting a term life policy as an option to consider to clear your debt when you die. I am not sure whether to laugh or cry to think that life insurance is an acceptable plan for getting out of debt. You have to wonder just what kind of a society we have constructed these past 50 years or so and what it would look like if you removed consumer debt from the picture. There would be no grossly overpriced homes on the market or shiny new pieces of tin in the driveway every four years or so. You could kiss goodbye to all those 'must have' electronic gadgets we would all perish without. Student debt of thousands would be a thing of the past as would the designer clothes and all those meals out. Of course we would then be pretty much at a loss of what to do with all those unoccupied people who would be hanging around with nothing to do. What did we do with them before? I only pose the question I don't pretend to have the answer. I will leave those answers to all those highly intelligent guys and gals we have appointed to taking care of such issues ....... how they doing so far?? It seems that the world's answer to the BIG debt issues are to simply borrow more money and pay off debt with even more debt. Enough for now, I think I am getting a headache! Continually raising property taxes is NOT sustainable for a great many people in Nanaimo, in spite of what the $150,000 + club at city hall seem to think. When I was a young whipper snapper growing up the guys I knew couldn't wait to get under the hood of a car and learn what made it tick. Where I grew up most of the men knew how to take care of their own routine vehicle maintenance. Granted, what was under the hood back then, didn't take a computer interface to tell you which electronic module you 'might' need to replace. You never thought of going to a mechanic to change your plugs, install and gap new points or replace just about anything else that needed doing. You certainly did not pay someone else to change your oil, lube your chassis and install a new oil filter. It just wasn't done where I grew up. You only took your car to the mechanic for major work such as installing a new timing chain or doing a valve and ring job. Although some of the guys I knew, would have done that on their own as well. I have a fond memory of helping a buddy, with a few other friends, change out the motor in his '58 Chevy when he threw a rod in his old 348 'mill' as we used to call them. We didn't have the luxury of a garage with any fancy gear to lift out the old engine, and drop in the new one. But is is amazing what creative minds (and perhaps a bit foolish) can accomplish using a very sturdy branch of a big old maple tree and a block and tackle. Worker's Safety Board?? We don't need not stinkin' Worker's Safety Board. The title of this little rant speaks to the skills or lack there of, of the current crop of workers in the oil pit at some of these express lube and oil services. Two times now I have gone to nationally known companies to have my car's oil changed, chassis lubed and a new oil filter installed. And twice now, from two different companies the monkey in the pit missed some of the grease fittings. The first guy missed two, and the second guy missed one. Since I am one of those guys who listens to his car, I think I caught the missed fittings before any real damage was done to my steering components. 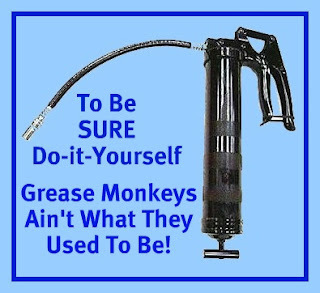 But from now on, I will either do the chassis lube myself or take it to my regular mechanic for the oil. lube and filter service. The only reason I have used the express oil change companies, is due to the convenience they offer. You don't need an appointment or make any special arrangements like you need to with your regular auto service, but after these last two experiences I won't be going back to them anymore. I'll either do it myself or book an appointment with the company that does my 'serious' auto work. Monday August 29, 2011 3:00 p.m.
455 Wallace Street, Nanaimo, B.C. The purpose of the Special Open Finance /Policy Committee of the Whole meeting is to receive information regarding proposed amendments to Council's Grants Policy and deal with other general council business . Nanaimo RCMP are issuing a public advisory after an incident of indecent exposure was reported yesterday at Westwood Lake. The most recent involves a male seen masturbating in a neighborhood near Westwood. Investigators believe this person may be responsible for prior incidents at the lake. The suspect is described by a witness as being a white male, mid thirties to forties with a slim build and dark curly hair. “Officers have identified several persons of interest but have not made an arrest in this matter. In the mean time the public is urged to be cautious and report any criminal activity in the area ,”said Constable Gary O’Brien, media spokesperson for the Nanaimo RCMP. if you are confronted or see criminal activity , leave the area immediately and report the incident to the police. On August 26, 2011 at approximately 10:25 am, the BC Ambulance Service contacted the Nanaimo RCMP to a report a drowning at Departure Bay Beach. Upon arrival at Departure Bay Beach the RCMP members were told an elderly male had been seen floating in the water. Witnesses immediately went into the water and brought the male ashore where attempts to revive him were unsuccessful. The BC Coroner’s Service were advised, and will be conducting an investigation into the male’s death. The death is not deemed to be suspicious. The Nanaimo RCMP Victim Services went to Departure Bay Beach and are providing support to the witnesses and family members. The victim, an 80 yr old man, is from Nanaimo. His name will not be released pending notification of next of kin. We will know before noon on Friday, Aug. 26th whether the fight HST corner led by former Premier Bill Vander Zalm or the 'keep the HST' corner led by some business and favoured by the sitting Liberals, will have won the fight. The HST brought in by the Gordon Campbell Liberals (most of which are still in Victoria) proved to be the plucked feather that not only brought hissing, but fighting from the nearly bald goose. A large percentage of the BC population jumped at the chance to tell government they have really had enough and did not buy into the Liberal spin that it would be a revenue neutral, consumer friendly tax. Many saw the HST as a huge tax burden being taken off of business and put on the shoulders of the consumer.They didn't believe them and in great numbers told them so. Against the odds enough signatures were collected to force a government referendum to decide the issue. Premier Clark's Liberals (most the same as Campbell Liberals) in a gesture to demonstrate they are listening to BC taxpayers, promised to reduce the HST to 10% in a few years, or return to the 12% collected under the PST and GST tax formula. Clearly an effort to persuade BC residents to keep the HST. If they are able to reduce the HST to 10% there should be no reason they could not also reduce the combined taxes to 10% also, if there is the political will. It would seem our society has produced money addicted governments at all levels who seem to find it impossible to quit spending money which neither we, nor our grandchildren have to spend. The results of the referendum will be posted here as soon as they are made available. 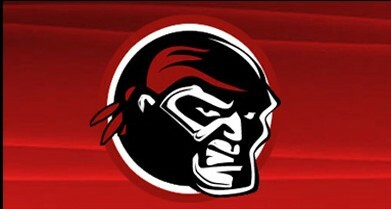 If you can't attend you can watch the game live by using this Nanaimo Info LINK. This Saturday August 27 help support Tour de Rock raise funds for cancer research. This fun day at Country Grocer runs from 11:00 am - 3:00 pm with lots of fun things to see and do and eat. There will be a hotdog sale by donation, raffles, a chance to ride Bill Peppy's stationary bike, head shaves, face painting, Camp Goodtimes books for sale and much more. So be sure to help the Cops for Cancer and enjoy some fun family time at Country Grocers on Saturday. For more information about this and other Tour de Rock fundraisers visit their website HERE. Join the Bastion City Wanderers for a 12km walk this Saturday Aug. 27 at Buttertubs Marsh. You can register in the parking lot of Buttertubs Marsh starting at 9:30 am with the walk getting underway at 10:00 am. For more information about this walk and the Bastion City Wanderers please visit their website HERE. Ron Coupal is the originator of Nanaimo Green Patrol which is a volunteer organization that intends to show 'pride of place' in a meaningful way. Ron is seeking to find like-minded citizens who take pride in their neighbourhoods and want to see them clear of litter. He personally puts on a comfortable pair of shoes, grabs his golf cart equipped with litter container, extension grabber and heads off to improve his neighbourhood and gain some valuable exercise in the process. To find out more about how you can get involved visit the Nanaimo Green Patrol website HERE. Kudos to Ron for taking pride in Nanaimo and being willing to do something tangible about it. Visit his website, then put on your shoes, grab a garbage bag and off you go. Your area will thank you, and so will your health. For complete event schedule including Saturday and Sunday visit the Blues Society website HERE. Remember when gold was considered the standard by which you could gauge the worth of a country's currency? Remember when saying something was 'as good as gold' meant it couldn't get any better? 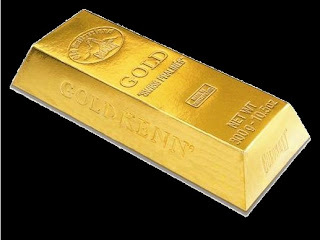 Well, if you bought some of that gold on Monday for about $1900 an ounce you might be unhappy to know, it is now worth about $1700 an ounce, just another example of a trading system governed by greed and fear, run by a bunch of Harvard degrees playing big boy monopoly. You don't have to have a Masters in economics to look around the world today and realize that NO ONE seems to have a clue what in hell they are doing and that includes Presidents, Prime Ministers and Kings. In technical terms big businesses, banks and even countries are actually bankrupt and until the worlds leaders figure out how to hit the reset button we are going to be in for a bumpy ride for years and years to come. Historically, when countries got themselves into a mess, they simply declared war on someone which put all the young people to work, and gave the old folks something to work on. However, that is not much of a solution when the whole world finds itself in the same collective mess. Passing Your Road Test In B.C. Given the great weather we are having, and given it is the final two weeks of freedom for the kids, most of us can be forgiven if the next civic election is far from our minds. However, it is time for those seeking to guide the city for the next three years to seriously outline a platform that they not only think will get them elected, but they will commit to if they are elected. Nanaimo civic polictics for the most part is just a little bit of theatre with special interest groups throwing their support behind their favoured candidate assuring them enough money for signs and ads to get themselves elected. If history is repeated fewer people than ever will even bother voting with the result that councilors will be elected with less than 15% of the eligible vote. The voting statistics in Nanaimo (and Canada in general) are a sad reflection of how we handle a freedom people around the world are laying their lives down for. Yet, we are too self centered and self absorbed to get involved in our community and have our say in how our tax dollars are going to be spent for the next three years. We can make up all sorts of excuses for our own apathetic laziness, but the fact of the matter is that democracy will only work when we ALL are involved in the process, our lack of involvment has led to the current political landscape which most of us are unhappy about, but too damn lazy to do anything about. For candidates, and would-be candidates I offer the following suggestions for what I think could be a sound election platform for candidates to campaign on. Ones which I seriously think will benefit Nanaimo for years to come, as clearly the current council and city staff have never demonstrated any real desire or ability to hold the line on taxes. Remember we could have had a ZERO percent tax increase for five years, but council led by city staff chose to spend $16 million on a shiny new office for city staff. They did it all behind closed doors, and without going to tender for the building. Complete Core Review At City Hall. Limit top management jobs to no more than 5 year term. Zero based budgeting in all departments, eliminate the bloat in the budget, remember there was $12 million just lying around waiting to build an annex. 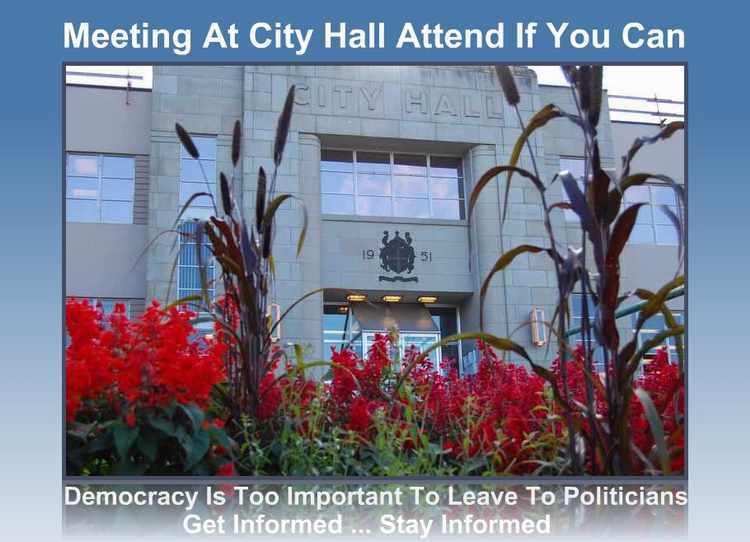 Institute a Town Hall meeting every three months allowing the public to ask questions of city council in a public forum. Transparency and openess are absolutely necessary. Rip up contract for new annex and apply money saved to holding line on taxes for the next 4 or 5 years. Revisit the demands imposed by VIHA and seriously consider if we need a new water treatment plant. If we do need a new plant, hire an outside project manager to manage the entire project, as I doubt anyone at city hall is capable of running such a costly project. Remember, it is the same bunch that brought you a $52 million convention centre for only $75 million. Examine all costs associated with 'emergency' line to Harmac and determine if it is really necessary at all. Commit to holding the line on tax increases to ZERO for the next ten years, and mean it! This past weekend while enjoying a stroll through Maffeo Sutton Park aka Nanaimo's waterfront jewel, I snapped these two pictures of different folks just enjoying the great weather and the great outdoors. I imagined the top team hitched to a sled mushing through the snow in the great north, and the pride this young fellow must have at being able to ride a two wheeler without those darned training wheels. Although while I saw him, the bike seemed to be being used more like a skateboard with his feet rather than the pedals providing propulsion. 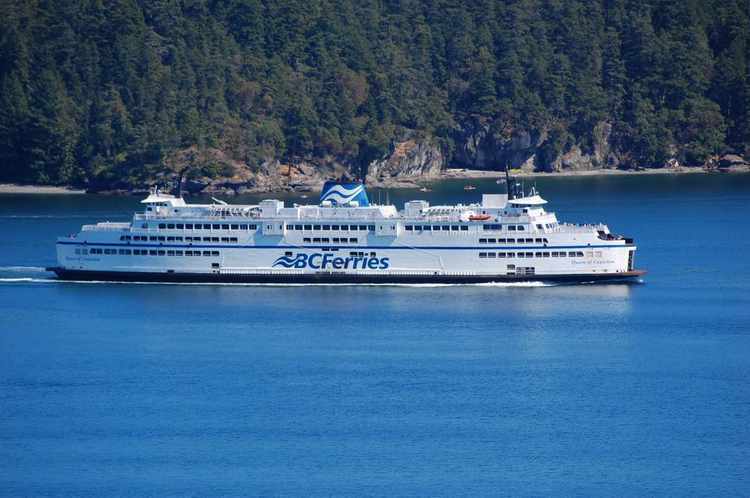 It is being reported in an article in the Times Colonist that the BC Ferry executives will be facing some tough choices in an attempt to deal with a loss that could now exceed $20 million. Among some of the ways planned to deal with the losses are increased fares, cut out 400 sailings per year, encourage early retirement and layoff many on-call casual workers who were available to crew extra sailings. Keeping the two Spirit ships on the Tsawwassen-Swartz Bay route docked for most of the winter, is another cost saving measure. Listed in the article as some of the reasons for the huge loss is the U.S. economy, high Canadian dollar, high fares, high salaries and changing travel patterns. As can be expected, poor management is not given as another reason for the loss. The corporation has some very well paid execs at the helm as well as on the board of directors Ultimately, they are the ones responsible for the current financial situation. Nanaimo's weather is looking nothing short of fantastic for the next ten days at least and while lawns and gardens may need more watering, the lack of clouds and rain is welcome after the bummer of a summer we had this year. So, the last days of summer break for the kids before heading back to school looks like local lakes and water parks will be getting lots of use over the next little while. The average sale price fell off in July 2011 by 7% to $354,077.00 compared with $382,672.00 in July 2010. For the month of July 2011 total number of sold homes in Nanaimo decreased from 102 units in July 2010 to 84 units for the month representing a decrease of 18%. 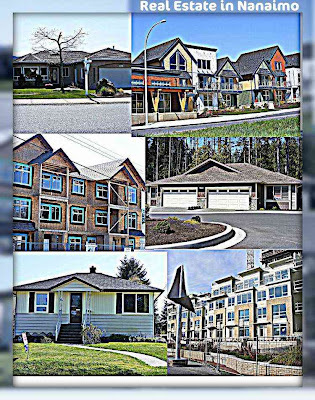 Following sales figures are based on average MLS sales summaries for Nanaimo and other Canadian cities for July 2011. Talk About 'Band Aid' Solutions !!!! I hope they use something stronger for wing repairs such as maybe duct tape! 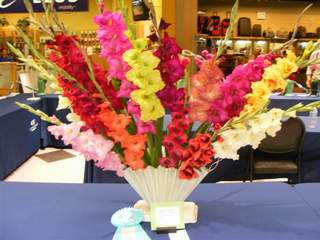 There were hundreds of brightly coloured Dahlias and Gladiolus on display in Country Club Center over the past weekend. I had no idea there was such a wide range of colour and type of Dahlias. Ranging from tennis ball size all the way up to dinner plate size with a wide variety of petal type as well. The annual show is put on by the local Gladiolus and Dahlia Society who can be reached by calling Ray Lauzier at 250-756-2927 or via email at rlauzier@telus.net. Until repairs are complete at the Gabriola Ferry terminal which was damaged when a portion collapsed under the weight of a paying truck; foot passengers get to and from the island via water taxi leaving from Dock F in the inner harbour. Vehicle traffic to and from Gabriola arrives and departs from Duke Point ferry terminal. The work on the damaged dock is expected to be complete by the end of August. Thrifty Foods has issued a warning that extra lean ground beef sold in either regular or family packs may contain fine pieces of Styrofoam. The beef affected came only from the Longwood Station location at 5801 Turner Road and has a best before date of Aug. 22. You will receive a full refund by returning the affected product to any Thrifty Foods store. If you require more information about this recall you should call 250-544-1234. 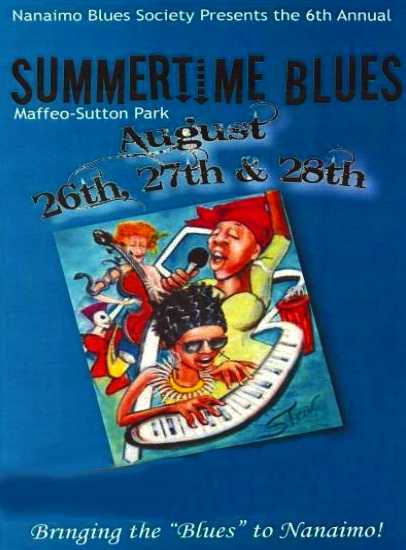 Nanaimo Blues Society Summertime Blues! It is reported in the Times Colonist that NDP leader, Jack Layton passed away at his home on Monday morning in the presence of those nearest and dearest to him. Mr. Layton was 61 years of age and had recently stepped down as party leader due to his illness. The photo of Mr. Layton above, is taken from the party's website which shows him in Courtenay earlier this year as he campaigned and successfully led his party to official opposition status for the first time in it's history. Monday August 22, 2011 4:30 p.m. The regular meeting of the Finance Policy Committee of the Whole has been changed to a Special Open Council Meeting to deal with items of a time sensitive nature and other general Council business. The Vancouver Island Exhibition opens today (Friday) and runs Saturday and Sunday with something for everyone to see and do each and every day. Real fans will take advantage of the three day pass so they can take in all the fair has to offer. For complete details and a schedule of events for all three days visit the VIEX website HERE. Alberni Outpost and Gone Fishing of Nanaimo have teamed up to bring Nanaimo the first annual pink salmon Kayak Fishing Derby. Entry fee is $25 per person with all proceeds going to support the Nanaimo River Fish Hatchery. You should enter in advance at either Alberni Outpost or Gone Fishing, you will be able to enter on the day of the derby at Maffeo Sutton park but only between 8:00 - 9:00 am. The derby is for human powered watercraft only (not from shore or a motor boat) such as kayak, canoe, row or belly boat etc. There will be hidden weight prizes, largest fish and many other categories, which will insure that anyone who enters the derby will end up with a prize at the end of the day ....... even if you get skunked! The grand prize of a 12' fishing kayak valued at $1,000 will be won on a draw basis, so everyone entering the derby will have a shot at the grand prize. The derby headquarters on the day of the event will be set up on the point at Maffeo Sutton Park on the water side where the Newcastle Island Ferry comes in, but on the point facing the Millstone River. You can phone for more information if needed 250-760-0044. A robber’s get away was short lived after being arrested within minutes of robbing a gas bar on Bruce Ave Wednesday afternoon. Just before 5 PM a robbery was reported at a gas bar located at the intersection of Bruce Ave and Eight St. A lone male entered the store and, in front of several customers, held a knife to the clerk’s neck and demanded money from the till. An undisclosed amount was handed over and he then fled the store. Police were on scene within minutes and with the assistance of in store surveillance cameras and multiple witness accounts , a solid description was provided and sent out to responding members. Approximately ten minutes after the robbery, a member spotted a male matching the description of the robber. The suspect was promptly arrested and taken into custody without incident. A knife believed to have been used was also located a short distance from the male. Investigators flooded the area and their efforts were rewarded with the recovery of the stolen money from a near by residence. A 26 year old male who is known to police was held in custody and was to appear before a Nanaimo Provincial court judge this morning. Police are recommending one count of robbery . “This incident was a perfect example of the police and community working together to solve crime. The business had excellent state-of-the-art surveillance cameras installed and numerous witnesses came forward without hesitation, to provide accurate eye witness accounts of the robbery. Our members responded quickly and by doing so, a violent offender was arrested and the stolen money had been returned to the business,“ said Constable Gary O’Brien, media spokesperson for the Nanaimo RCMP. Global news is reporting that a company known as " Country Carpet Cleaners" as suspects in several cases involving seniors who report things stolen after the company cleans their carpets. Incidents were first reported in Port Alberni in June and then in July in Nanaimo and in all cases the cleaners make friends with vulnerable seniors and then ask to clean their carpets. After the cleaners leave items have been reported missing including cash, collectables and other valuables. All of the victims were quite elderly with several in their 90's. The suspects involve a heavy set man in his 50's with short brown hair and a moustache, he is accompanied by a younger man in his early 20's and police believe a woman may also be involved. They may be using an older brown van. Anyone with any information is asked to call the Nanaimo RCMP at 250-754-2345. For the first time ever, the Vancouver Island Exhibition will be opening a portion of the exhibition grounds tonight for a sneak peek at this year's fair. The grounds will be open from 5:00 - 9:00 pm and the price of admission is the donation of a non-perishable item for the Loaves and Fishes food bank. Parking will also be FREE on Thursday night as well. There are events happening as well as the midway will be open, brought to you by Shooting Star Amusements. The Exhibition is on this weekend on Friday, Saturday and Sunday and you can see the full events schedule by visiting the VIEx website HERE. If you've ever wanted to be in movies this might be your golden opportunity. Extras are being sought for a Hollywood production that will be filmed on the Island sometime this fall. The movie company is looking for ordinary folk of all ages to appear in the making of a movie that is rumored to be about that legendary hero with a bir S on his chest, but of course that is all top secrect, so it is just speculation. If you can't make the casting call but are still interested you can send our information and a headshot of yourself to movieextrasearch@shaw.ca. 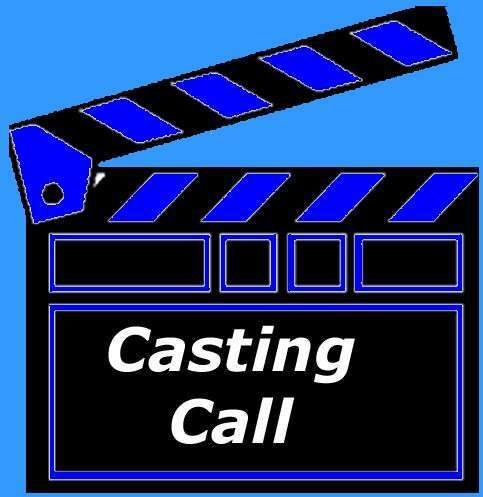 This could be your opportunity to get 2 or 3 seconds of fame on the big screen, who knows you might be the next big thing in the movie business if you are discovered by some Hollywood producer. The pink salmon are back in Nanaimo waters a little bit later than usual but perhaps the bummer summer affected their time clocks also. They were being taken at the mouth of the Millstone River in front of the Lions Great Bridge at Maffeo Sutton Park. The resident seal was also on hand grabbing an easy early morning snack. 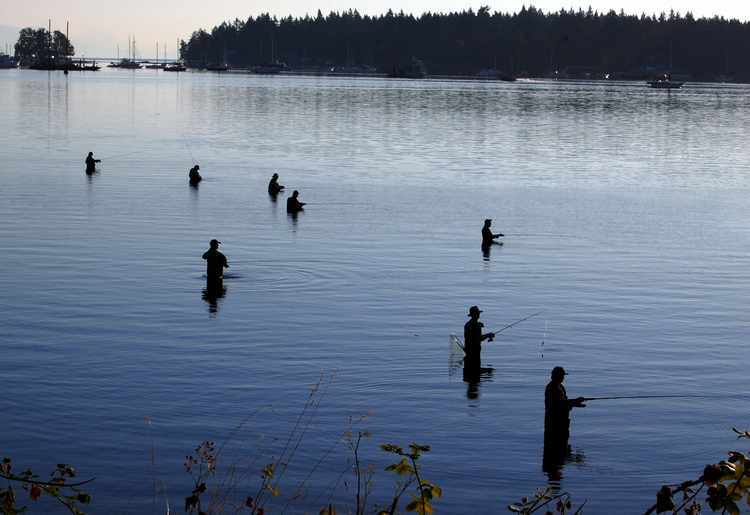 You don't need a boat or a lot of flashy gear to try your hand at salmon fishing right now. A reasonably inexpensive rod and reel, a few lures, a dip net and waders if you are leaving shore. And don't forget to get your fishing license if you don't already have one, you will need a Tidal Water license with a salmon endorsement. 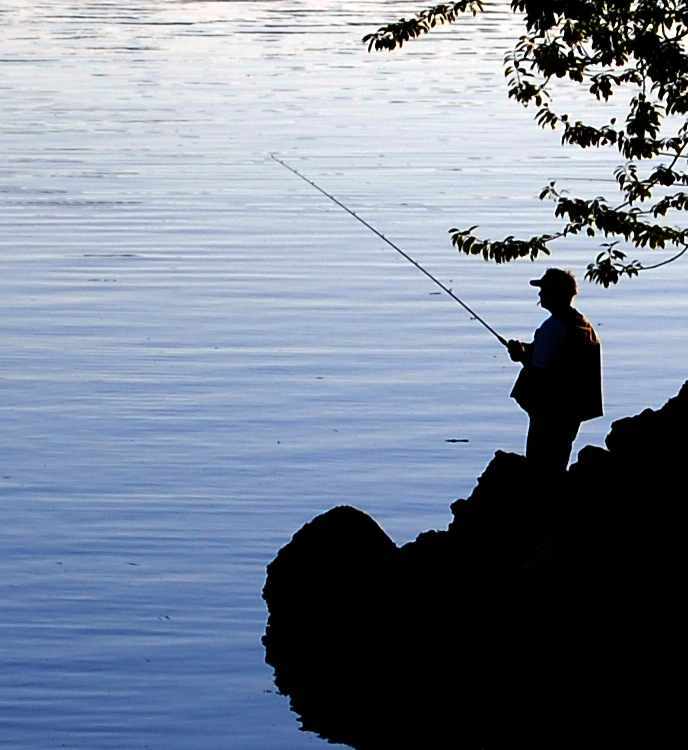 You can try your luck at the mouth of the Millstone River, or on the fishing dock at Swy-a-lana Lagoon or in Departure Bay where the river enters the Bay. It is one of the surest fisheries which should insure a successful catch even for the novice angler. So get a licence, grab some gear and warm up the bar-b-cue because salmon is on the menu tonight! Taking Fishin' Comfort To the Max! If you have lived in Nanaimo for more than the last ten years you might remember when Port Place Mall was called Harbour Park Mall. At one time Harbour Park Mall was 'THE' mall in Nanaimo being the home for one of Nanaimo's major department stores as Sears occupied the space now housing the casino. It was the bustling place on Saturday mornings as most of Nanaimo made their way downtown to take advantage of this weeks sales, and to check out Sears main rival at the Eatons store on Victoria Cresent. From one end of Commercial Street to the other there was a wide variety of stores that served the needs of Nanaimo residents. There was a camera shop, jewelry stores, furniture stores, hardware stores, sporting goods, Woolworths and the Met, discount furniture store, Nanaimo's best bakery, clothing stores and more. It truly lived up to it's name of being Commercial Street. The recent $100 million center piece, aka the Vancouver Island Convention Centre has certainly changed the appearance of downtown, and there is indeed renewed foot traffic as locals stop for a coffee or something to eat, but it no longer lives up to the name Commercial Street as there are few reasons you would head downtown to do your major weekly shopping anymore. The above picture shows what is now a vacant lot which used to be occupied with about half of Port Place Mall where the food court used to be and the government liquor store and post office. I am sure when this project is finished complete with new highrise it will be another positive change to Nanaimo's downtown. However, I can't help but wonder if the Nanaimo of 40 years ago wasn't just as nice a place to live in spite of all the growth we seem to cherish. That was back in the days before user fees, when your taxes actually paid for your water, sewer and garbage. That was also back in the days when double digit tax increases were not the norm and councils would never have dared to spend $16 million on a new office without first asking the taxpayer if they thought it was a good idea. Aaaaahhhh for the good old days. The new Parks and Recreation Activity Guide for the fall of 2011 and the spring of 2012 has now been delivered with your copy of the News Bulletin. Mine came with the Bulletin on Tuesday, Aug.16. If for some reason you do not receive the Bulletin or did not receive a copy of the new Activity Guide you can also view the PDF online version by clicking HERE. 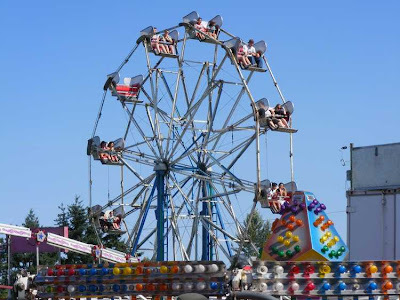 For the first time ever, the Vancouver Island Exhibition will be opening a portion of the exhibition grounds on Thursday night for a sneak peek at this year's fair. The grounds will be open on Thursday evening from 5:00 - 9:00 pm and the price of admission is the donation of a non-perishable item for the Loaves and Fishes food bank. Parking will also be FREE on Thursday night as well. This past weekend marked the end of the month long sandcastle competition and display held every year by our good friends to the north in Parksville. While I am sure their attendance has been affected by our bummer summer to a degree they still had over 75,000 visitors to the display as of last Saturday and they still had Sunday to go. Their attendance record of over 99,000 will likely still stand. As always how anyone can take compacted sand and turn it into such delightful objects is a real mystery to me. Packing a pail with wet sand and making a castle pretty much tested the limits of my sand construction skills. If you missed this years display the two photos above show you a couple of my favourites. A Calgary based employee recruitment company will be in Nanaimo on Sept. 7 interviewing people interested in filling vacant positions in the oilfield. Qualified applicants can also fax or email their resume and driver's abstracts to the company before that date. Some of the positions being advertised include equipment operators, field specialists, mechanics and electronic techs. The jobs offer competitive salary, bonus, benefits and safety and job training. The company will be interviewing in Nanaimo at the Dorchester Hotel on Commercial Street on Sept. 7, 2011 from 3:00 - 7:00 pm. For full contact information visit the Nanaimo Info Help Wanted page HERE. One of the construction projects in Nanaimo that seems to be steadily coming along is the new building on the corner of the Port Place Mall property across from the Salvation Army New Hope Centre. This corner lot has been vacant for years, with one or two enterprises occupying it from time to time, the most recently remembered being a used car lot of some kind. I think this new building will be a combination of office and retail when complete. Repairs are being made to the damaged passenger ramp at the Gabriola Ferry terminal across from Port Place Mall. The ramp was damaged when a truck loaded with asphalt drove onto the trestle supported ramp which was designed to carry people and not heavily laden trucks. A portion of the trestle collapsed and the truck wound up in the water. Fortunately the driver escaped serious injury by jumping from the truck. In the meantime a water taxi is bringing Gabriola foot passengers to the F dock in the inner harbour, while car traffic is being re-routed to Duke Point terminal. The terminal is not expected to return to regular use until the end of August. The weatherman did his part and held off on the forecast showers for the Show and Shine on Commercial Street on Sunday from 10:00 am to 3:00 pm. I think everyone in Nanaimo over the age of 50 was on Commercial Street over the course of the day. There clearly was a totally different crowd than there was at the last downtown event which was more geared to young families with children. Vintage and classic cars lined both sides of Commercial Street which was closed from Bastion St. to Terminal Avenue with cars lining the street from one end to the other. There was a huge sampling of Mustangs from the 60's to the present day as well as the popular offerings from Chevrolet and Chrysler that all were just a part of growing up in the 50's, 60's and 70's. I mused to my wife what would a show and shine look like in another 30 years if it were to show off todays automotive offerings, and I think it would be one colored 'bar of soap with wheels' as well as one in another color. Yes, those cars sure bring back the memories, and I was not the only one as you could not help hearing people telling each other why certain cars were special to them. Comments such as "I had one of those except it was the six cylinder, or it was a different color", were typical of comments that could be overheard as the appreciative crowd strolled down memory lane. It was a great show and I for one am pleased that the car owners take the time to bring their 'babies' to these events so they can be enjoyed by the rest of us who simply don't have the time or money to lavish on the restoration of such fine pieces of machinery. I hope this becomes a regular event as it is definitely popular with a different demographic in Nanaimo, than is drawn to the usual downtown events. "The project involves construction and installation of a new entry door into the Administration Offices of the Port Theatre located at 125 Front Street, Nanaimo, BC. Work will include: excavation, concrete forming, paving stones, fabrication of metal handrails, cutting and removal of concrete wall section, lighting and supply and installation of an aluminum store front door system." In spite of what city councilors and city staff will tell you, there has never been a serious attempt to control the number of dollars being taken from the average Nanaimo taxpayer to continue funding projects hatched by a very creative public service. 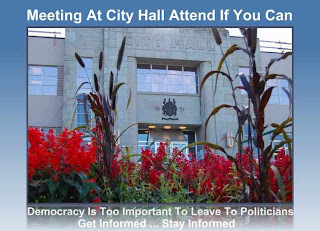 Another myth, is that city council actually oversees how city staff spend your tax dollars, when in fact, most on council ....... well, no need to go there. The current work you see being done in front of the Port Theatre will provide a new entry door for the admin offices at a cost to local taxpayers of $75,585.30, thank you very much. That is on top of the approximately $500,000 every year taxpayers contribute to the theatre so that patrons don't have to spend another $5.00 per ticket. With the upcoming civic elections, if any current councilors dare to run again, I am sure they will all promise to take a serious look at how your taxes are spent. Remember, that is the same bunch that brought you a $16 million annex without even going to public tender. Nanaimo RCMP can now confirm Stuart Bryan Gregg has been charged with 10 counts of theft under $5000.00, 5 counts of mischief under $5000.00 and two counts of possession of stolen property. Gregg was arrested on Tuesday August 09 by members of the Nanaimo Property Crime unit. He has been remanded in custody , until his appearance in Nanaimo Provincial Court on August 23, 2011. No other persons have been charged as of this date. Nanaimo RCMP Property Crime are continuing to try and locate the owners of some of the stolen property. Police in Nanaimo are requesting the public's assistance in locating a missing 45 year old female from Nanaimo. Paula MELVIN left her Nanaimo home on August 6th, 2011 and has not returned home nor made contact with her family. MELVIN is described as Caucasian, approximately 5 ft 4 inches and 220 lbs with short, shaggy, sandy brown hair. (Click photo for higher resolution image). "Melvin is living with a brain injury, which makes her particularly vulnerable", said Cst Sherri Wade, with the Nanaimo RCMP. "Her family are very concerned that she may be in trouble and not sure how to reach out for help." Damage to the trestle at the Nanaimo terminal for the Gabriola Ferry has rendered the facility unsafe for vehicle passage. The damage resulted when a paving truck went off the trestle and into the water on Thursday night, the drive escaped the vehicle unharmed. 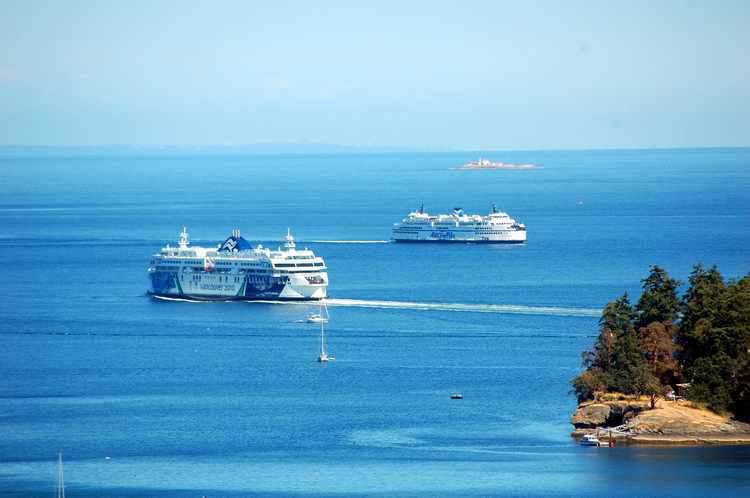 Until repairs are made, vehicle traffic between Gabriola and Nanaimo will be routed to Duke Point while foot traffic will be serviced by water taxi from Gabriola to F Dock at Nanaimo Harbour. 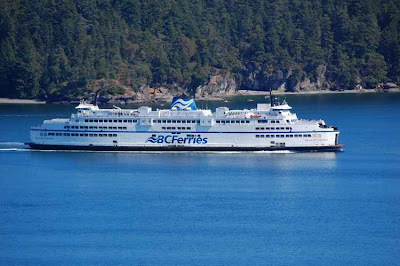 BC Ferries will be posting schedules for both services on their website sometime today. A True Canadian Economic Indicator? What Kind Of Industry Does Nanaimo Want? Nanaimo Weather Outlook is GREAT!